Welcome to Sri Somesvara Temple! 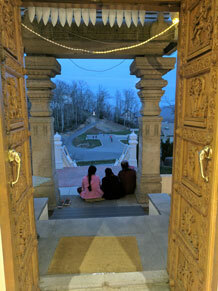 Located in the Blue Ridge Mountains of Western North Carolina, Sri Somesvara Temple is a Vedic Shiva temple at the center of Mount Soma, a community commonly referred to as “Mount Kailash of the West.” Visitors travel great distances to experience Sri Somesvara’s powerful Linga, profound silence, and timeless vibrations. If you want to feel the presence of Lord Shiva, come to Mount Soma! Learn more about the Temple. Pandit Prasad is dedicated to maintaining the purity of Vedic knowledge and tradition. Thank you Rishi & Dashant Patel! Do not use vehicle GPS!